How do you improve on a vacation to one of the most gorgeous spots on Earth? By going there with people who know the places that will steal your heart. The best way to visit the San Juan Islands is to go with people who can help you find ― and give you access to ― the islands’ many secret spaces. And believe us, there are many! Captain Ron Fugere and Mate Mari know these islands very well. They have years of experience sailing in and around the many quiet coves and harbors of the 172 named islands in the San Juans and they’d love to show you. Decide whether you want to work or rest on your vacation. Sailing aboard Diminuendo is truly an all-inclusive vacation . 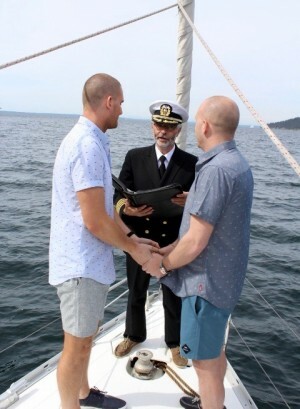 For starters, you have guides – Ron and Mari – to navigate the Salish Sea; you get all the experience of sailing the mighty Pacific Northwest without having to know how to trim the jib or lower the mainsail. You also have someone to make all your meals and a tour guide who can point out pods of majestic orca whales, romps of playful otters and lounging herds of seals. 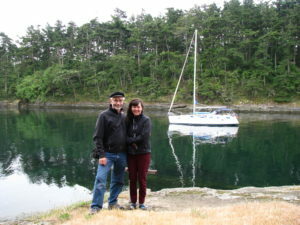 Because Captain Ron and Mate Mari can handle everything about Diminuendo, you can enjoy a NW Washington sailing vacation while having no sailing experience whatsoever. With “bareboat” charters, on the other hand, you’re on your own. You get the boat and nothing else. That can be a wonderful experience for those who want it, but be aware that it’s usually not as simple as it sounds. While you do get to experience the joy of sailing your own vessel, you also must handle all the day-to-day tasks and challenges. On a bareboat charter, you and your passengers may worry about boat safety, how to navigate through the rocky shallows or how to plot a course across the shipping lanes (and upon return to port, you’ll have to refuel, empty the sewage tank (ick!) and wash the boat inside and out). If you really want to handle the boat yourself, just ask! On Diminuendo, you’re invited to take the helm as little or as much as you like, always secure in the knowledge that you’ll be supervised by Captain Ron and Mari. Prices between bareboat and all-inclusive charters tend to be comparable, especially after you factor in food, which is not provided on bareboat trips. We’ve created well-loved typical itineraries for those who want to kick back and enjoy the beauty of the San Juans – hitting all the highlights. Our chartered sailing itineraries work well for all ages, making them a great option when traveling with friends and family. Alternately, you’re free to plan a specific route or spend a few extra days in a certain place (great for visiting the islands for a wedding, for example!). Whatever course you decide to set, chartered sailing aboard Diminuendo can help make this summer vacation your best ever. Just give Ron or Mari a call today.